Astronomers using the partially completed ALMA observatory have found compelling evidence for how star-forming galaxies evolve into 'red and dead' elliptical galaxies, catching a large group of galaxies right in the middle of this change. For years, astronomers have been developing a picture of galaxy evolution in which mergers between spiral galaxies could explain why nearby large elliptical galaxies have so few young stars. The theoretical picture is chaotic and violent: The merging galaxies knock gas and dust into clumps of rapid star formation, called starbursts, and down into the maws of the supermassive black hole growing in the merger's core. As more and more matter heaves onto the black hole, powerful jets erupt, and the region around the black hole glows brilliantly as a quasar. The jets blowing out of the merger eventually plow out the galaxy's potential star-forming gas, ending the starbursts. 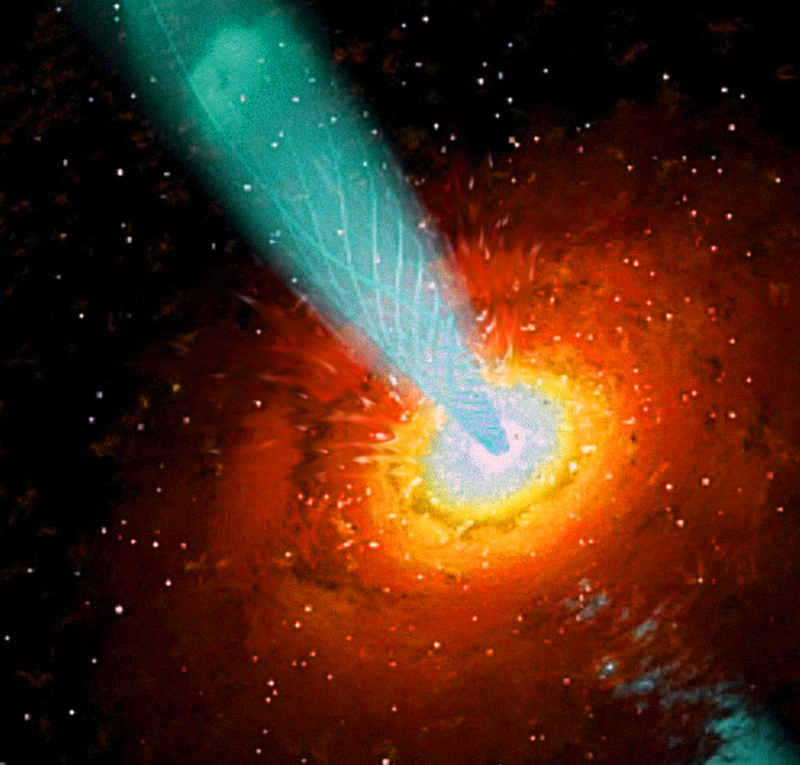 An artist's concept of an active supermassive black hole and its jet, with outflow of star-forming gases. Until now, astronomers had never spotted enough mergers at this critical, jet-plowing stage to definitively link jet-driven outflows to the cessation of starburst activity. During its Early Science observations in late 2011, however, ALMA became the first telescope to confirm nearly two dozen galaxies in this brief stage of galaxy evolution. What did ALMA actually see? "Despite ALMA's great sensitiviy to detecting starbursts, we saw nothing, or next to nothing - which is exactly what we hoped it would see," said lead investigator Dr. Carol Lonsdale of the North American ALMA Science Center at the National Radio Astronomy Observatory (NRAO) in Charlottesville, Virginia. Lonsdale presented the findings at the American Astronomical Society's meeting in Austin, Texas on behalf of an international team of astronomers. For these observations, ALMA was tuned to look for dust warmed by active star-forming regions. However, half of Lonsdale's two dozen galaxies didn't show up at all in ALMA's observations, and the other half were extremely dim, indicating that there was very little of the tell-tale dust present. "ALMA's results reveal to us that there is little-to-no starbursting going on in these young, active galaxies. The galaxy evolution model says this is thanks to their central black holes whose jets are starving them of star-forming gas," Lonsdale said. "On its first run out of the gate, ALMA confirmed a critical phase in the timeline of galaxy evolution." Once their star-forming gas has been blown away, merging galaxies will be unable to make new stars. As the last generation of massive and brilliant, but short-lived, blue stars dies out, the long-lived, lower mass, redder stars come to dominate the merger's star population, giving the gas-starved galaxy an overall reddish hue over time. To support this gas-starvation theory, astronomers needed to see it at work in lots of merging galaxies with high power jets. The place to observe enough of them is among the quasars, active galaxies found in the Universe's past, several billion light-years away. Lonsdale said, "The missing phase had to be among quasars that could be seen brightly in infrared and radio wavelengths -- mergers young enough to have their cores still swaddled in infrared-bright dust, but old enough that their black holes were well fed and producing jets observable in the radio." Their selective hunt for these specific quasars started with NASA's Wide-field Infrared Survey Explorer (WISE) spacecraft, which has hundreds of millions of objects in its all-sky, infrared survey of the Universe. Lonsdale led WISE's quasar survey team that picked out the brightest, reddest objects this infrared telescope had mapped. The team then compared its selections with NRAO's VLA Sky Survey of 1.8 million radio objects and chose the overlapping results as the most suitable targets for their search for starburst activities with ALMA. Observing at longer infrared wavelengths than WISE, ALMA enabled Lonsdale's team to discriminate between dust warmed by starburst activity and dust heated by material falling onto the central black hole. ALMA has 26 more WISE quasars to probe before Lonsdale and her international team publish their results later this year. Meanwhile, she and her team will observe these galaxies, and over a hundred more, with NRAO's newly upgraded Karl G. Jansky Very Large Array (VLA). "ALMA revealed to us this rare stage of galaxy starvation, and now we want to use the VLA to focus on delineating the outflows that robbed these galaxies of their fuel," Lonsdale said. "Together, the two most sensitive radio telescope arrays in the world will help us truly understand the fate of spiral galaxies like our own Milky Way."